The governorship candidate of the United Progressive Party (UPP), Osita Chidoka, has said that the recent uproar in the state over the free vaccines offered by the military to school children was an indication that residents distrust the army. Viola Okolie, the media director of Osita Chidoka Campaign Organization in a statement, said the campaign was concerned about the panic caused by the conflicting reports over a medical outreach organised by the military in some schools in the state. There was pandemonium across the South-East and Delta State following rumours that some immunisation officers accompanied by persons in army uniforms invaded schools and were injecting children with unusual vaccines. Following the unsubstantiated rumour, parents and guardians stormed schools to ‘rescue’ their wards thereby causing heavy traffic and commotion. This came in the wake of the medical outreach embarked upon by troops as part of its package for the ongoing ‘Operation Python Dance’ codenamed Egwu Eke. Chidoka said that even though his campaign has nothing against any genuine social responsibility service by the military, he was disturbed by the twist of events which shows the intensity of mistrust and lack of confidence in the military occasioned by undesirable effects of the Operation Python Dance II. “This is not the first time the military will be undertaking such exercise, but the panic and rejection that confronted the latest exercise speaks volumes of the gap that now unfortunately exists between the military and the civilian population in the South-East due to the Operation Python Dance. “While they were running from the military, many residents were trooping to similar interventions including that organized by the Chidoka Campaign, which recorded hundreds of medical interventions in Onitsha, the same Wednesday. Our medical team has been in the field for several weeks now and is still attending to people without any incident. “Our take therefore, is that the Operation Python Dance has painfully eroded the faith and confidence the citizens hitherto had in the military as their pillar of protection. The professional misconduct of some unscrupulous uniformed men involved in the exercise have succeeded in instilling fear in civilians, while retarding their desired reliance on the military for such laudable interventions. “Consequently, we urge the military high command not to gloss over this incident, but take urgent and practical steps to allay the fears of the people and rebuild public confidence in the noble institution of the military, especially in the South East. “The first step towards this is for the military authorities to immediately end the Operation Python Dance II and withdraw soldiers from the streets. This is in addition to releasing the outcome of its investigation on reported rights violations in the Operation Python Dance II, while appropriate sanctions are meted out on erring officers,” the statement reads. Candidate of the Progressives Peoples Alliance (PPA), Mr Godwin Ezeemo, has said that many residents of the state are suffering untold hardship but are living in denial of the dire economic situation. Ezeemo said this yesterday during a reception organized by the Umuchu community in Onitsha, insisting that the suffering is as a result of bad leadership, bad roads, epileptic power supply, dilapidated education and healthcare system and a high rate of unemployment. “Leadership is the ability to translate vision into reality but this major quality is missing in the present administration, which is why I desire to change the status quo with your support. If you still have to go through bad roads as you go about your daily duties, you are suffering. If you cannot find standard and prompt healthcare when the need arises, you are suffering. If you are an employer of labour and you cannot find trained young people with the right attitude to work for you, you are suffering. If you still experience inadequate power supply and high cost of power, you are suffering. “I urged everyone to shun the deceit called mega party or Igbo party because they do not exist in real world but in the lives of political jobbers and those who use political office to enrich themselves. Of all the candidates vying for governor, none has used his personal money to carry out projects for the state. I am the only one who has done that because of the love I have for my state,” Ezeemo said. 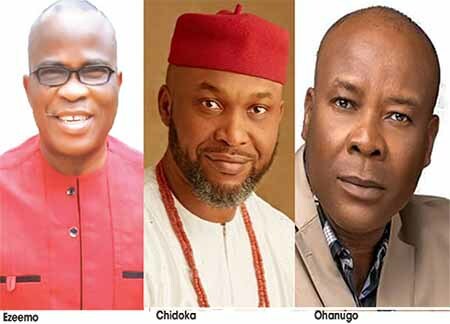 A non-partisan pro-democracy pressure group, Democracy Network, has launched an aggressive campaign to discourage the Anambra electorate from mortgaging their future with the paltry gift from the candidates for the November 18 governorship election. The convener of the group, Chief Uche Nwogu, who made the appeal at a media parley in Abuja yesterday, told the voters that they would be the biggest losers by boycotting the election in compliance with the directives from the Indigenous People of Biafra (IPOB). Nwogu further added that the network has equally embarked on vigorous voter education to sensitize the electorate to vote according to their conscience, adding that boycotting the election would be detrimental to their wellbeing. “On the issue of IPOB asking Anambra people to boycott the election, the fact is that whether you come out or not, a governor would still be elected on that day and he will be your governor. So, it will be in your interest to come out and participate. “Voter apathy is one of the greatest challenges in Nigeria’s democracy. People shy away from participating in politics because they feel once a candidate is not anointed by the godfathers; it is difficult for such person to win. “We are already collaborating with the Anambra Broadcasting Service ABS, the National Union of Road Transport Workers NURTW and other organisations in the state to help get the message across to the voters. “A bag of rice might last for some weeks but bad governance lasts much longer. Money politics did not start today but what we are saying is that looking around, in some places, you can see the effects of bad governance and we are saying from henceforth, do not shortchange yourself. “We want to mobilise them to come out massively to vote because whether they vote or not, government must continue. So, it is better for them to come out and be part of the process,” he stated. The candidate of the Better Nigeria Progressive Party (BNPP), Chief Ikem Ohanugo, has promised to unify indigenes and non-indigenes in the state if he wins the election. He said this yesterday when he unveiled his running mate, Mr. Augustine Ogwatta, to the Assembly of Concerned Non-Indigenes (ACNI) . He said the time had come when voters should consider what a candidate could offer rather than looking at his wealth or where his father comes from. He advocated a change of attitude among voters, saying that the people should not clap for any governor who builds roads, because it was the tax payers money that is used to construct the roads and not personal funds. He promised that he will make Anambra the China of Africa and would attract investments that that would improve the economy. “Today everybody is talking about restructuring, which means something is wrong somewhere and we should start from the South-East. I was born and brought up here in Anambra and I have been paying my tax. Nobody tells me that I am from Imo state but the moment I asked why my tax should be increased, they tell me to go to my place; and I ask, if citizenship is gotten by birth, then am I not a citizen of Anambra? “They call those who were born here non-indigenes which is a misnomer because by the constitution, they are indigenes by birth. Anybody who resides here for more than five years and participates in the affairs of the area should not be seen as a stranger anymore. That nomenclature is a thing they have introduced to subdue the voting power of those they call non-Anambrans . Until people are treated equally, they will never see themselves as one,” Ohanugo said. Uche Nwogu, you are the most illiterate and foolish human being . Uche Nwogu you have failed when you have not started. Uche Nwogu you are misleading your own children for generation and not we the IPOB. Uche Nwogu you are campaigning to govern people when you are blind like other gpvernors. Uche Nwogu no governor will govern that state if the population turn down low. As you said, if we vote or not the governor will continue, then let him continue because we will not attend any vote, PERIOD. Who would ever allow a poisonous, destructive snake like the python, a python sentient enough to dance, to minister to his children? who knows if this python has injected some poison into whatever medication it offers? Solution: let Mr Dancing Python keep his Greek gift. You cannot mollify a people you have murdered their brethren with suspicious gifts. Any NIGERIA Military vanicination, under any guise, especially any where in the South-East and South-South, is highly suspicious, and should not be trusted! NIGERIA Military pyton dance in the South-East and South-South, is obviously a devilish barbaric dance, probably as parts of the Buhari’s administration revengeful mission against the Igbos for giving him less electoral votes in the 2015 Presidency Election! If they, the NIGERIA Military, are carrying out any vaccination activities as part of their pyton dance agenda, obviously, it’s very deadly and harmful, in every sense of reasoning! How can you trust Boko haram military that massacres your young people and now that the world is seeing the gory pictures of massacres and tortures of pro Biafran youths, they want to inject you with poisonous viruses. Please Ndigbo wakeup and protect your people and land from these evil and murderous jihadist Fulani tribe. Please do not allow your children to be killed slowly by these evil Nigerian Army. NIGERIA Military activities in the South-East and South-South is highly deceptive and designed carry out some hidden Nothern political cabals’s agenda, alongside of the President Buhari’s administration revengeful mission against the Igbos of South-East and South-South for giving him less electoral votes in 2015! South-East and South-South people should not be blamed for being suspicious of genocides through the said vaccination activities by the NIGERIA Northern dominated and marginalized Military! Prevention is better than cure, my brothers and sisters! Nkwucha abuhu ujo, umu nne na nna! NIGERIA Military activities in the South-East and South-South is highly deceptive and is currently designed carry out some hidden Nothern political cabals’s agenda, alongside of the President Buhari’s administration revengeful mission against the Igbos of South-East and South-South for giving him less electoral votes in 2015! South-East and South-South people should not be blamed for being highly suspicious of genocides through the said vaccination activities by the NIGERIA Northern dominated and marginalized Military! They are not trusted for now, and are advised to stop all their evil and devilish subtle agenda, especially against the people of the South-East and South-South in NIGERIA! Please, my brothers and sisters, always be carefully on guide! NIGERIA Military activities in the South-East and South-South is highly deceptive and is currently designed to carry out some hidden Nothern political cabals’s agenda, alongside of the President Buhari’s administration revengeful mission against the Igbos of South-East and South-South for giving him less electoral votes in 2015! There is obvious need of using longer spoon and to always sensitively be on necessary guard, especially when we are surrounded with the devils in sheep’s clothing!